A hoist-operated vacuum powered tilter with manual rotation for reorienting and positioning large metal, wood, plastic, composite, and fiberglass panels is being introduced by ANVER Corp. of Hudson, Massachusetts. 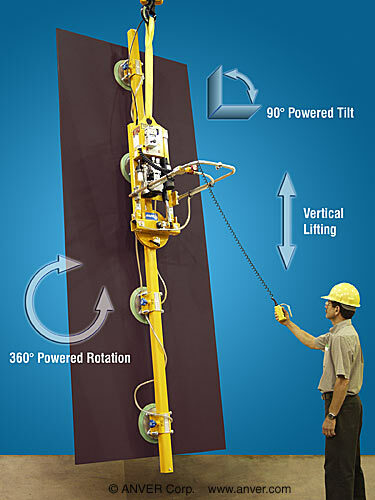 The ANVER PF Series Vacuum Tilter-Rotator is a below-the-hook vacuum powered lifter with 90 degree powered tilting and 360 degree manual rotation to let a single operator reorient and position large sheet. Featuring quad-spring mounted vacuum suction pads that are easily adjustable along a 10 ft. beam, this work positioner has fully integrated pendant controls on the handlebar. Allowing workers to easily change load orientation during a process, the ANVER PF Series Vacuum Tilter-Rotator is designed for loads up to 1,000 lbs. Supplied in models powered by compressed air or 115 VAC, standard features include an ergonomic handlebar, a vacuum gauge and leakage sensor with audio-visual alarms, and a wide selection of rubber vacuum suction cups.